Interested in a Home-based Craft Demonstrator or Business Opportunity? Opportunity comes to those who grasp the moment. this has always been a dream of mine and now I am living the life I have always wanted. My only regret... that Stampin' Up! did not come to Australia earlier in my life-time. Joining Stampin' Up! 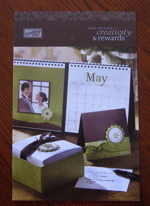 is such a fun way to earn an income while spending time doing the crafting that you love so much! You'll be surprised at the variety of options available to those who "Join our Family", and at the very friendly community of Stampin Up demonstrators. Take the Opportunity to browse through the Demonstrator information to see if any of the options strike a cord with your own lifestyle or wishes. If you would like to receive further information Contact me using this form, and I will answer your questions. You don't have to be experienced at stamping - I had never stamped before. 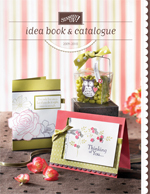 Stampin Up provides loads of company support through publications such as the annual Idea Book and Catalogue. Click on the picture to browse the catalogue. But best of all, is the friendship and support of other demonstrators, Australia wide. The company brochure relating to the Demonstrator Opportunity states... Join our Family. This is such a true statement. The feeling of goodwill and belonging is so evident, that it is a pleasure to be part of. I love to try new techniques and set new challenges - I am even teaching myself to write this web-site - and I am severely technologically challenged! However I thrive on the opportunity to try something new, and I am having so much fun that I want to tell everyone how wonderful it is belonging to the Stampin' Up! Family. Explore and enjoy my web-site to see the sorts of things I, as a team leader, can offer you. And remember if you would like further information on this Opportunilty, I would love to hear from you. I now have a Demonstrator Business Web site where you can apply on-line for your Starter Kit. You will need to obtain a code from me, but it is a simple process. Just go to my DBWS home page and select the START YOUR OWN BUSINESS menu.